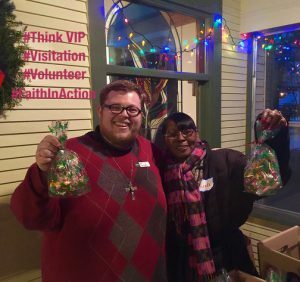 VIP Alum Cody Maynus and Vis Companion Linda Goynes share treats at our Christmas party. What do a Monastic Studies grad student, a physical therapist, a Visitation alumna, a European Salesian spirituality “seeker” and a married woman now leading women’s programs in Afghanistan have in common? Did you think “VIP”? If so, you’re right on! Our former VIPs are now in these endeavors, fueled by Salesian spirit and Gospel focus from their service in north Minneapolis. Encourage someone you know to consider a year of service with the Visitation Sisters. These VIP alum spent a year in our monastery’s Visitation Internship Program which began in 2011. Community living, development of relationships among the people of north Minneapolis, Salesian spirituality and ministry on the north side are essential components of this volunteer program. VIPs spend 10 months living in the neighborhood in housing provided by the Sisters. After visiting the many options for ministry in north Minneapolis, they offer 30 hours of service per week at a site that fits their talents and interests; they also spend 10 hours of service with the Sisters. Living simply, studying Salesian spirituality and praying and working with the Sisters in the monastery give both VIPs and Sisters a strong sense of community. Spiritual direction and prayer opportunities are important personal and spiritual supports for VIPs. ..if you are a young adult considering a year of “giving back and growing in your faith” in a vibrant, urban setting with a monastic community, consider this unique opportunity and “Think VIP”! The Visitation Internship Program is open for women and men between the ages of 21-35 years. Our website has specific information about the application process and the program itself. The website also has a recent video interview with one of our former VIPs, Anna Dourgarian and is delightful to view! We are now taking applications for the 2017-2018 year. Encourage someone you know to consider a year of service with the Visitation Sisters. Pray for young adults as they discern how to live out the Gospel, and if you are a young adult considering a year of “giving back and growing in your faith” in a vibrant, urban setting with a monastic community, consider this unique opportunity and “Think VIP”!